of precancerous lesions in tissue from the intestines of a rat that was fed high-selenium broccoli and injected with a carcinogen. Selenium. It's an essential trace element that helps keep the immune system humming and free radicals under control. Recent evidence from human studies suggests that the mineral reduces the incidence of cancer when taken in higher doses than most diets supply. That news has prompted increased use of selenium supplements. Sales rose from $60 to $66 million—a 10-percent increase—between 1996 and 1997, according to most recent statistics from the Nutrition Business Journal published in San Diego, California. The idea of selenium supplements doesn't sit too well with nutritionists like John W. Finley and Cindy D. Davis at the ARS Grand Forks Human Nutrition Research Center in North Dakota. They know the selenium salts in some supplements can be toxic when too much is ingested. On the other hand, "it's harder to get too much selenium through foods," says Davis. Different foods package selenium in different biochemical forms. And the body uses these forms differently, explains Finley. An expert in selenium nutrition, he wants to find what form or forms provide the widest range of health-promoting properties—including cancer prevention. 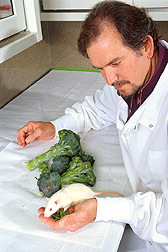 holds one of the rats and a sample of the enriched broccoli. Recent research in Finley's lab is demonstrating that high-selenium broccoli may be the best source of an anticancer agent. Other researchers discovered that garlic stores selenium in a form that appears to be most active against cancer. And broccoli and brussels sprouts also store selenium in this form, known as selenium methyl selenocysteine, or SeMSC. The body simply snips the end off this amino acid to produce the anticancer agent—methyl selenol. Though garlic is higher in SeMSC, most Americans are not likely to eat enough of it to produce the desired effect, Finley notes. So his group has focused on testing selenium-enriched broccoli as a way to get effective levels of SeMSC into the body. Along the way, however, he learned how animals and people metabolize other food forms of the mineral. "It's a long and tortuous path for the form of selenium prevalent in grains and some meats—selenomethionine—to get converted to methyl selenol. It's easier for selenium salts—the forms used in some supplements—to get there. And it's only one step for the form in broccoli," Finley says. In a series of rat studies, Finley, Davis, and former colleague Yi Feng, now with the University of Louisville's medical school, confirmed that differences in selenium metabolism translated to differences in the risk of colon cancer. First, they demonstrated that selenium salts—both selenate and selenite—can prevent the first of several steps that can lead to cancer, whereas the grain form—selenomethionine—was ineffective. Selenium salts reduced the number of adducts in the rats' colons by 53 to 70 percent. Adducts are formed when a carcinogen binds to DNA, explains Davis. "If the damage isn't repaired, it can lead to tumor formation." The researchers had beefed up the rats' selenium levels through their diets for several weeks. Then they injected the animals with a potent carcinogen called DMABP, for short. 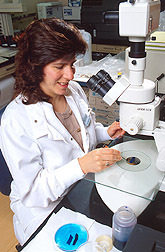 Their findings support those of others showing that selenite protects against adduct formation in rats' mammary cells. The group got similar results when they looked for a later stage of colon tumor formation called aberrant crypts. These are immature colon cells that have gone awry. "Not all aberrant crypts develop into cancer," says Davis, "but all colon cancers begin as aberrant crypts." Feng painstakingly counted the crypts and found more in the animals fed selenomethionine than in those getting selenium salts. The most exciting phase of this work started in a Grand Forks greenhouse. The researchers grew ordinary broccoli in soilless media with added selenium to observe uptake of the metal. Finley says that studies show that broccoli grown in the presence of selenium can accumulate substantial amounts. Some commercial broccoli grown in California has up to 50 times more selenium than normal, he notes, because the irrigation water is naturally high in the mineral. When Finley analyzed his broccoli, however, he found it had 100 to 200 times more selenium than the California heads. When the researchers pitted the high-selenium broccoli against the salt form selenate in rat studies, they made sure to control for any beneficial effects of broccoli itself. The vegetable is high in antioxidants and contains other substances shown to be active against cancer. So animals in each test group got ordinary broccoli as well as the treatment. Treatments consisted of daily doses of either 0.1 or 1.0 mg of selenium per kilogram of the rats' body weight, either in the form of enriched broccoli or selenate. The higher dose is representative of the selenium level that reduced cancer risk in a human trial, Finley says. After giving the animals DMABP, Feng again looked for precancerous aberrant crypts and for collections of these cells, known as aberrant crypt foci. High-selenium broccoli always resulted in fewer precancerous lesions than selenate did, says Finley—about one-third fewer at the 1.0 mg/kg dose. And the number of lesions decreased as the dose increased. The results were so promising that Finley and Davis decided to repeat the experiment. And they confirmed the findings using a different salt—selenite instead of selenate—and a single but higher dose of selenium—2.0 mg/kg. They also gave the animals a much more potent carcinogen—dimethyl hydrazine (DMH). Although it produced many more lesions, the rats fed high-selenium broccoli had half as many aberrant crypts as the animals getting selenite. "If there's a call to increase selenium intake, we currently have few choices other than high-selenium yeast or selenium salts," says Finley. "Selenium-enriched broccoli is a potential source of the mineral in a highly effective form." His group is looking for other potential benefits of the enriched vegetable.—By Judy McBride, Agricultural Research Service Information Staff. John W. Finley and Cindy D. Davis are at the USDA-ARS Grand Forks Human Nutrition Research Center, P.O. Box 9034, University Station, Grand Forks, ND 58202-9034; phone (701) 795-8353, fax (701) 795-8395. "Colon Cancer Curbed by High-Selenium Broccoli" was published in the June 2000 issue of Agricultural Research magazine.